Okay, let me rephrase that: flat heroes bore me; complex ones never disappoint. Thankfully for me (and everyone, I suppose) most writers present their audiences with complex heroes and heroines. These are people who come from interesting backgrounds, overcome obstacles, and are layered throughout the process. Antiheroes interest me more than any sub-genre, to be quite honest. Heroes who are perfect are boring; heroes who have both darkness and light inside of them are complex, interesting, and REAL. Once Upon A Time's journey as a series has always been one that focused on the idea of what constitutes a hero, "happiness," and villainy. What we've discovered as we've progressed is that characters cannot be relegated to boxes. Regina is both a hero and a villain; Rumpelstiltskin is both self-sacrificial and selfish; Elsa is both careful and self-sabotaging. The theme in "A Tale of Two Sisters" is that our heroes (Regina, Elsa, and Rumpelstiltskin) believe that they are monsters. There's this constant dichotomy within each of these characters -- darkness and light; goodness and evil. The beauty of heroism is that it is not a one-person journey. Everyone within Storybrooke who considers him or herself a hero is who they are not just because of the decisions they've made, but because of how beloved others view and treat them. Regina may believe herself to be a monster, forever trapped in darkness, aching to be a hero with a happy ending rather than a reformed woman whose good intentions are met with nothing but heartbreak... but that's not how Emma sees her. Emma vows in the premiere to fight for Regina's happiness. Elsa -- as those of us who watched the film saw in Frozen -- was told that she was a monster because of her powers. That isolated Elsa from everyone and everything she loved, including her sister, Anna. But Anna always saw the good in Elsa, the light and the hope, and THAT is what keeps Elsa going, even when everything else is bleak. It doesn't prevent her from self-sabotage, but that love -- that completely sacrificial, beautiful and pure love -- from Anna is what makes Elsa who she truly is. And Rumple? Well, this man has been called a monster more times than anyone on the series, to the point where I do believe a part of Rumple will always believe he is that. His new life with Belle, however, and Neal's death have convinced him that he needs to become the man Neal died for... the man Belle deserves. So, if you're ready, let's check in on the residents of Storybrooke and see what we learned in "A Tale of Two Sisters," shall we? As someone who has seen Frozen way too many times for a twenty-five year old (... and owns it on Blu-ray), I was intrigued by the season finale's introduction of Elsa and after watching "A Tale of Two Sisters," I'm even more interested in how the season will arc our snow queen's tale. The theme of the season premiere is a question: "Are you a monster?" Elsa was taught from a young age to be afraid of her powers and to hide them because she could hurt the people she loved (and did) whenever she utilized them. And in the Once Upon A Time version of this story, we see a very similar depiction of Elsa: our snow queen hides in Storybrooke, listening as the residents cry "monster!" and run (those words rattle and haunt her, though they were referring to our literal snowman Marshmallow). Elsa is a hero, but she is broken and scarred. In the premiere, while helping Anna to prepare for her impending wedding, Elsa discovers her mother's diary and blames herself for their death. This is a recurring element of Elsa's character, this harrowing self-sabotage that she constantly does. Elsa protects those she loves (and we're going to see that a lot in the coming weeks, I presume) heroically and yet, when she looks into the mirror, she still sees the woman who froze the entire kingdom. She hears the resounding cries of "monster!" within her head. And she looks at her power as a punishment and something to be feared rather than a gift, even in OUAT. She is scared of herself and that's a theme that runs really deep in the season four premiere and will continue to run deep this season. I, for one, loved the introduction to Elsa and I'm excited to explore more of her OUAT-specific character traits and strengths this season. Whenever I see criticism of this ship, I see the exact same criticism that exists in others (Jeff/Annie, Nick/Jess, Oliver/Felicity, etc. etc.) and it is centered around the idea of change. I've seen those who do not ship Jeff/Annie from Community specifically target this: "Those two a terrible idea," these anti-shippers argue, "because Annie keeps forcing Jeff to change who he is. Jeff should be with someone who doesn't do that." And I find it intensely interesting because I find it intensely wrong. Whenever I see criticism of the Captain Swan ship (the name Hook/Emma fans have given themselves), I am met with arguments that fall along the same spectrum. But this criticism is narrow-minded and arguments rather incorrect in their presumptions and definitely in their final analysis of the relationship as a whole. Those ships listed above are not tropes of "one person tries to fix the other/make them better." The center of the Hook/Emma relationship and of all of the others is this: Hook is able to identify things in Emma that she is never able to identify or vocalize about herself because she does not believe them to be true. Let's backtrack for a moment and contemplate this, because since the anti- arguments for this relationship are supposedly character-focused, the defense should be the same, right? The way that I view the characters in any television show is as follows: television characters are a) flawed and b) layered until they are proven to be otherwise. I will presume a character to be complex and layered until a writer or producer portrays them as stagnant, flat, or one-dimensional. Hook is complex; Emma is complex. These are both extremely layered characters who bring a lot of hurt from their past into their present in Storybrooke. Hook, however, sees something within Emma that she is unable or unwilling to see in herself. He sees a hero. A great mother. A savior. A fighter. Let's think about how Emma Swan views herself then. The only way Emma can see herself is through a filter of her own mistakes. Instead of a hero, she sees a failure. Instead of the image of a great mother, she sees a woman who gave up her son. Instead of a savior and a fighter, she sees the young woman who used to steal cars, who pushed others away because she couldn't deal with love or the idea of it. She sees herself this way because she's LIVED herself this way. The reason that Hook and Emma work (and that Jeff/Annie, Nick/Jess, Oliver/Felicity, etc.) work is because we NEED other people to see in ourselves what we cannot. When Emma is at her lowest, Hook is there beside her to remind her of who she really is -- not those failures or mistakes from years ago or from the day before. Even when she doesn't WANT him to be there to support her, he IS. It's because she needs to hear how wonderful she is from Hook (the premiere was especially great because during Emma's magic scene, Hook earnestly expresses his belief in her) because maybe - just maybe - one day she will believe it. So you see, Hook/Emma's literal foundation is not on the idea that one character is "better than" or "more deserving of" another (I hate that people who argue against those ships literally assign positions to characters in a television series as if somehow some are of a lesser breed or quality than others simply because the viewer deems it so). Their foundation is definitely not on the idea that one person has to change another, either. Hook/Emma is founded on this simple concept: if you care about someone, no matter how many times they push you away, you keep returning not because you need to win them over but because they need to know how valuable they truly are. The season premiere finds Hook and Emma trying to establish what, exactly, they are after their romantic connection in the season three finale. And really, apart from running away from Marshmallow and a few cutesy little lines here and there, the two didn't share much screentime (I'm okay with that, given the fact that the finale was Hook/Emma-centric). Emma does, however, feel guilt for finding happiness at the cost of Regina's, so she pushes Hook away ever-so-slightly in order to gain perspective and rid her guilt. She gives him a quick kiss, though, which is progress for Emma. A year ago, she would have probably literally pushed Hook away, but in the season four premiere, she just requests that he remain patient. I love Regina's journey from Evil Queen to just-Regina; from dark, manipulative, and heartless to a woman who allowed herself to become not just open to love but open to the idea that she was CAPABLE of true, lasting love with Robin Hood. I've always found Regina to be the most complex force on this series -- just when she is on the brink of heroism, something has always seemed to hold her back, tethering her to her past and reminding her of who she once was. In "A Tale of Two Sisters," Regina vocalizes this concept to Emma: just when her life appears to be good, appears to be HAPPY and Regina allows herself that flicker of hope, something or someone reminds her of who she used to be. I think that sometimes we forget that "strong" isn't equated with "fearless." Across the years, out of all of the things Regina has faced -- Peter Pan, her wicked step-sister, a town that hated her, etc. -- the thing she has always feared most... is herself. Regina is afraid that everything she once was will be everything she always is. It's tragic and sad and heart-wrenching. How difficult would it be to live your entire life believing that you are a monster incapable of love, incapable of DESERVING love because of the things you've done? Moreover, how difficult would it be to live your entire life knowing that the people around you -- even those who love you dearly -- are constantly waiting with bated breath to see if you will return to your villainy, walking on eggshells around you like the group was at the diner in this episode, wondering whether or not one moment or confrontation will be the thing that causes you to snap back to the dark side? In the episode, Regina makes the decision to ask Sidney for advice: she needs him to become her Magic Mirror again so that she can recall the moment she sentenced Marian to death. Then, she will prepare to travel back into the past and ensure Marian dies before Emma and Hook arrive to rescue her. What is most striking about this whole story is something that Sidney tells Regina that he knew she would always come back for him and need him again. There's this flicker across Regina's face (credit to Lana Parilla for such a brilliant little nuance) because Sidney's statement confirms what she has believed to be true of herself: no one will ever see her as a hero; they'll always believe her to never truly be capable of change. And just as Regina nearly believes that about herself, she realizes that she ALWAYS has a choice: a choice whether to embrace her goodness for the sake of others or a choice to close herself off and let the darkness -- that familiar, sad, darkness -- re-envelop her. She save Marian from Marshmallow (the giant snow monster) in the forest, even though she didn't have to. I think it's always important that heroes and villains are given choices to make and that those choices define who they are and who they will become. Even though Regina saves Marian, she is still distraught and returns to her home, slumped against a door when Emma arrives. Now, kudos to whoever decided to block and direct the scene the way that they did because the door serves as a split screen -- on the left, Regina is slumped against the door, head between her knees in a pale, gray lit home while Emma stands outside, basking in a golden glow. The contrast between the subtle darkness (it's not black, but a shade of gray) and the light is poignant without being extremely cliched and beautifully done. After Emma leaves, Regina makes a new decision -- she won't go into the past to change Marian's fate, but rather find the author of the storybook that wrote all of their fates and ensure that the VILLAINS get a happy ending. Regina is such an intriguing character, so I'm interested to see how this chapter of her tale will unfold; she is not regressing as a character but rather trying to accept the person she believes herself to be and finding happiness in that state, if that makes any sense whatsoever. I'm definitely interested in her arc this year. Rumple talks to Neal's grave in "A Tale of Two Sisters," and throughout the episode struggles with his sense of identity: now that he and Belle are married, he vows to Neal that he will become the kind of man worthy of Belle -- the kind of man that Neal died to save. And the first step for Rumple in doing so is by exchanging the Dark One's dagger back (remember that at the end of last season, Rumple gave Belle a fraud) and celebrating with his love. Rumple has always been kind of a wildcard character for me -- I've never known whether or not to trust him, but I think that's kind of the point. Near the episode's end, Rumple cannot help himself and explores the magic behind a trinket he discovered in the house he and Belle are honeymooning at; he told his new wife that the trinket was nothing (lies, of course) and waves the dagger over it, revealing what appears to be a sorcerer's hat (looking oddly a lot like Mickey's Fantasia one). I'm not exactly sure how Rumple and Belle's story will unfold this year, but I'm interested to see if our magic-wielding man will evolve into someone worthy of Belle's love and Neal's sacrifice, or if the allure of power and control and magic will be too much for him to ignore. So now that the town of Storybrooke is growing in size and magic, power and the dichotomy between heroism and villainy are certain to play a larger role in the stories this year. Personally, I cannot wait. Georgina Haig is a great Elsa -- I can't wait for more of her in the future! 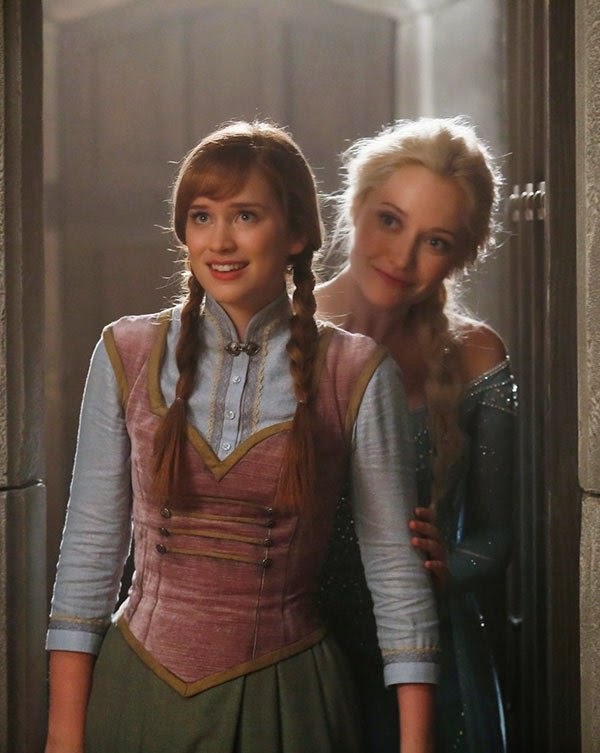 The casting of Elizabeth Lail as Anna was quite spot-on: she babbled and delivered lines exactly like I would have anticipated Kristen Bell would. Additionally, I am thrilled to have Scott Michael Foster on my screen as Kristoff. He brings the exact right energy and charm to the role as Jon Groff did in the film. "Is everything okay?" "No one's been incinerated yet, so that's a good sign." 10/10 for sass, Charming. Oh, yes... the Charmings are fine. They were in the episode briefly, but that's really all you need to know about them at this point. Grumpy let Sleepy be his designated driver. THAT IS ALL. The snow forming around Elsa's head whenever she was upset was a nice touch. This episode featured "Tale As Old As Time" and I started humming and swaying in my seat. "You have second thoughts? He won't smell like that forever." Regina wins for best shade in the episode: "Well, she [Marian] is awfully vanilla, can you blame me?" Hook not knowing what Netflix is but being excited about it is delightful.